Tire Monitor System (TMS) is a wireless direct tyre pressure gauge and monitoring system. Our experienced, creative engineers developed the first prototypes to address the need for an independent product for Off The Road (OTR) vehicles. Today TMS is capable of working in extreme temperatures and physical conditions and is used extensively across the mining, construction, tyre testing, earthmoving, container & cargo handling and transit sectors, around the world. 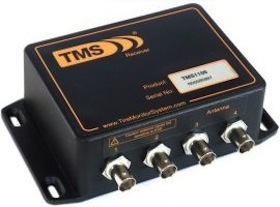 TMS sensors are mounted inside each individual tyre and temperature and pressure data is continuously transmitted to a receiver and display unit in the vehicle’s cab. This enables drivers and fleet managers to make sound operational judgements; for example a driver will know if a vehicle with a slow loss of pressure can complete a shift or reach a suitable location for maintenance. TMS Manager is a PC program designed by our experts to enable you to configure the system, set alarm conditions and monitor results while TMS Log Graph generates visual reports of tyre performance data logs from all vehicles fitted with a TMS. 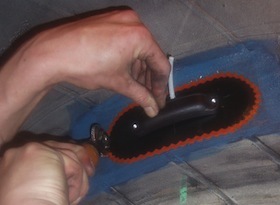 TMS2 Sensor being patched to tyre side wall. Company registered in England No. 03306387.